Reviewers from all around the globe are starting to publish their Olympus E-PL1 tests! Slrclub (korean) made a crazy long review. The text is available in korean only. But images videos and graphs are easily understandable! 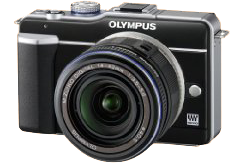 And finally PhotographyBay wrote a Olympus E-PL1 Hands-On Review! Preorders: Amazon / Adorama / BH all do have the BLACK E-PL1 in pre-order status. The Blue E-PL1 is in Stock on amazon! next post: Panasonic-Leica 45mm f/2.8 lens reviewed at photozone!